We love quilting and sewing books. Whether they are downloaded digitally or in hard copy, who doesn’t enjoy learning new things from books. Here are five quilting books we love! 1. Hexagons Made Easy. We love this book because it is full of tips and techniques to make truly projects using hexagons. 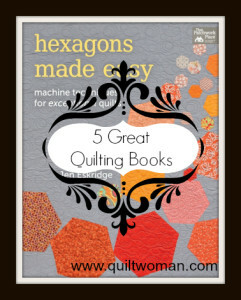 If you want to create stunning hexagon quilts and other projects, without Y-seams or hand sewing, this books is for you. Expert quilter Jen Eskridge makes it easy with a quick facing technique, a great alternative to English paper piecing. Learn to use hexagons two ways: appliqued onto a background or stitched together without a background for a two-sided quilt. There are 15 clever projects in a huge variety of sizes, from large quilts to pillows, wall hangings, table runners, pot holders, and more. 2. Bargello Quilts with a Twist. In this book, author Maggie Ball explores the possibilities of the new Bargello quilt block. 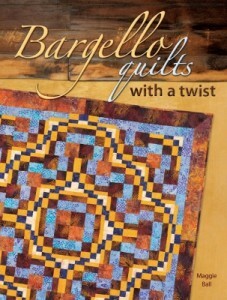 Bargello Quilts with a Twist presents an innovative alternative to traditional Bargello quilting. Maggie Ball’s versatile 16-pieced Bargello block, constructed from only four sets of four strips, is quick and easy to piece. From there, you can manipulate the block to create an enormous variety of designs with flowing lines and interesting secondary patterns. We also love that the book is signed by the author! 3. The Thrifty Quilter- What quilter doesn’t have scraps? Lots of scraps. Mountains of scraps. 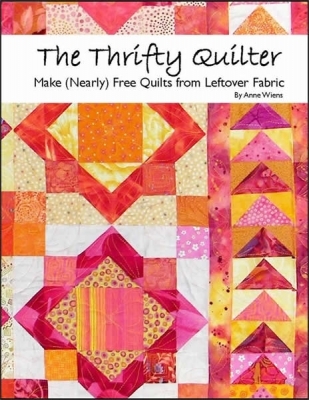 Anne Weins Thrifty Quilter System will organize your scraps and quickly turn them into colorful quilts for family, friends or charitable donations. With just three simple pieces, you can make any of the 80 blocks in this book in 2 sizes. Six setting options are included, giving you hundreds of design possibilities. And if that wasn’t enough, the quilt patterns in this book are AccuQuilt GO! compatible! 4. 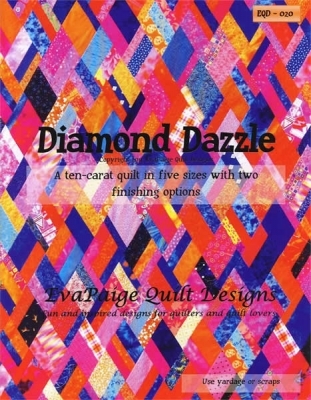 Diamond Dazzle– This booklet, by Beth Helfter, lets you use scraps or yardage to create the ten-carat beauty shown on the cover. Start with simple strip piecing, play with some templates, add a fun scrappy border strip (or don’t – it’s totally optional!) and end with a quilt that will bring on the oohs and aahs. Diamond Dazzle is a 12 page pattern booklet featuring full sized templates, detailed cutting and piecing charts, and five sizes (see below) with two border options. 5. 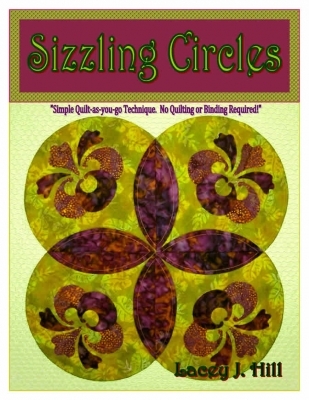 Sizzling Circles- If you long to include circular shapes in your quilts but avoid them, this book is for you! Sizzling Circles eliminates the need for bias edges and shows you how to use strip cutting to create that fabulous circular look. Learn how to use the Quilt-As-You Go technique and create magnificent quilts amazingly fast, with no binding requirements. Six unique and beautiful projects are included, complete with detailed illustrations, easy to follow instructions, and complete lists of all the fabric and supplies need to create them! Projects include wall hangings, a tote bag and a table runner. 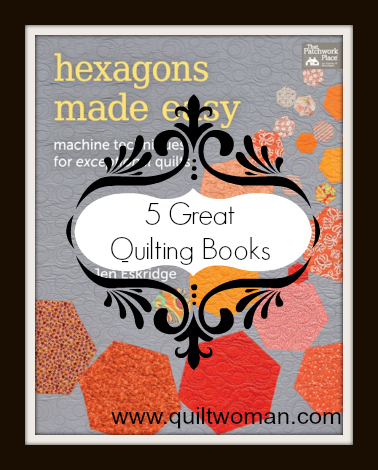 Thanks for joining our round-up of the five quilting books we love! This entry was posted in Books, Designers, patterns, QuiltWoman and tagged anne weins, Bargello Quilts with a Twist, Beth Helfter, Diamond Dazzle, Hexagons Made Easy, Jen Eskridge, Lacey J. Hill, Maggie Ball, quilting books, Sizzling Circles, The Thrifty Quilter. Bookmark the permalink. I say to you, I certainly get annoyed while people think about concerns that they just don’t recognize about.